This is my new/used bike. It is a 2002 Yamaha VStar 1100. It is my upgrade from the Triumph Bonneville I bought for purely emotion reasons. After a year of riding, I realized the Triumph was just too tall for me and with my ever increasing mileage, not comfortable for cruising. I'm about 5'1" and can sit on VStar flat footed. A short man owned the bike so there are risers on the handlebars, which help my reach. 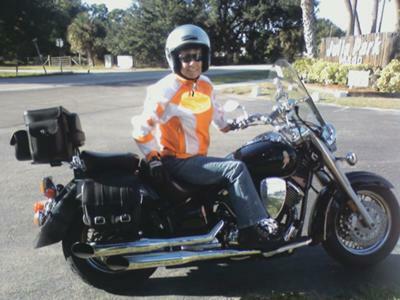 I love long rides in the country and living in SW Florida, I can ride year round. I named him "Max". I also have a VStar 1100. Although I am 5'11", I find the ride comfortable, as well. Hoping to relocate to your area soon. Maybe we'll see each other on the road!! Safe ride!! Max is a very handsome guy! I'm sure he'll take good care of you. Congratulations. Nice Ride lady.....your kinda cute too!